from Nov 24th – 27th 2017! at the Wealthy Affiliate University for only $ 299 per year! It’s only about 250 Euro per year!!! You are saving 60 $ and you will be at the Black Friday rate in subsequent years! how to make money online and how to become a Wealthy Affiliate! training videos and blogs, live chats and everything you need to run a successful online business! Wealthy Affiliate University wants you to succeed and to become a Wealthy Affiliate! If you are interested in reading my review about the Wealthy Affiliate University, click here. 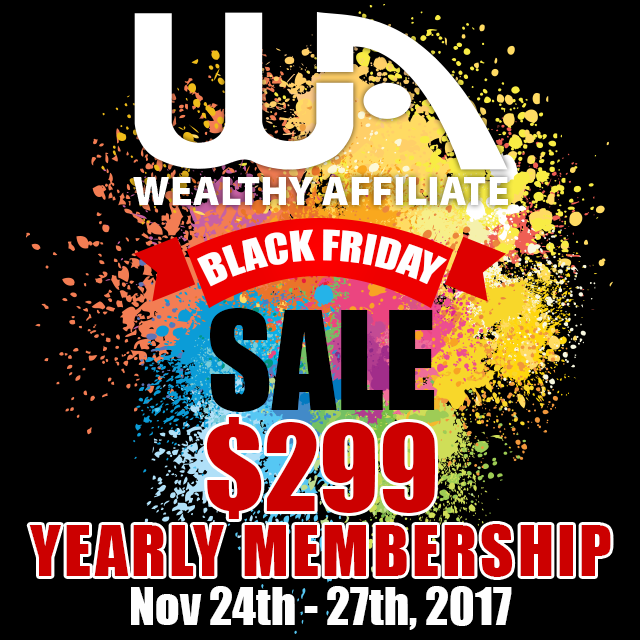 See you at the Wealthy Affiliate University – starting from Nov 24th 10 am PST (Pacific Standard Time). Habe Deine Seite aufgemacht, verstehe aber nicht viel davon, aber gut! Freut mich, wenn dir meine Seite gefällt. Ich werde bald ein Übersetzungstool einbauen, dann verstehst du mehr von der Seite.